Citation Information: J Clin Invest. 2016;126(8):2955-2969. https://doi.org/10.1172/JCI85506. E2F-mediated transcriptional repression of cell cycle–dependent gene expression is critical for the control of cellular proliferation, survival, and development. E2F signaling also interacts with transcriptional programs that are downstream of genetic predictors for cancer development, including hepatocellular carcinoma (HCC). Here, we evaluated the function of the atypical repressor genes E2f7 and E2f8 in adult liver physiology. Using several loss-of-function alleles in mice, we determined that combined deletion of E2f7 and E2f8 in hepatocytes leads to HCC. 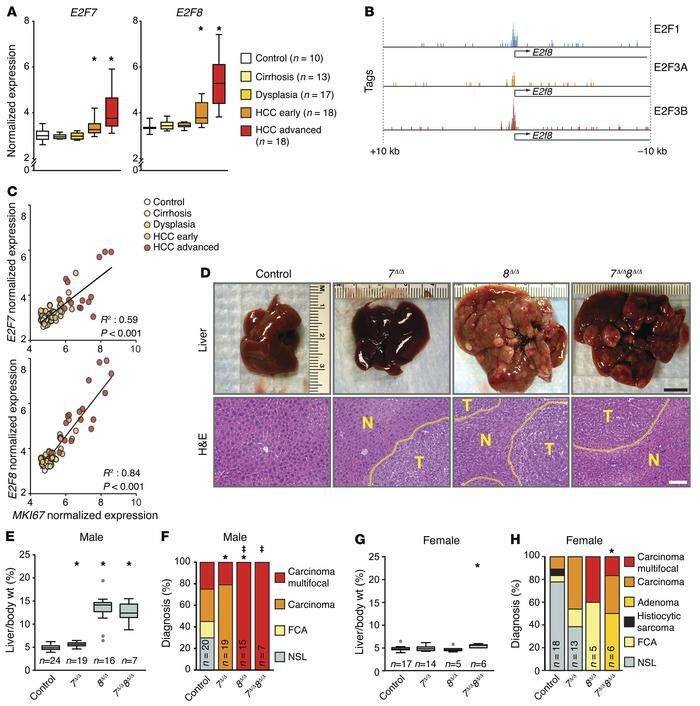 Temporal-specific ablation strategies revealed that E2f8’s tumor suppressor role is critical during the first 2 weeks of life, which correspond to a highly proliferative stage of postnatal liver development. Disruption of E2F8’s DNA binding activity phenocopied the effects of an E2f8 null allele and led to HCC. Finally, a profile of chromatin occupancy and gene expression in young and tumor-bearing mice identified a set of shared targets for E2F7 and E2F8 whose increased expression during early postnatal liver development is associated with HCC progression in mice. Increased expression of E2F8-specific target genes was also observed in human liver biopsies from HCC patients compared to healthy patients. In summary, these studies suggest that E2F8-mediated transcriptional repression is a critical tumor suppressor mechanism during postnatal liver development. Loss of atypical E2Fs leads to carcinogen-induced HCC. (A) Box plots showing the mRNA levels of E2F7 and E2F8 from patients with normal or diseased livers derived from Affymterix Microarrays, Wilcoxon tests with Bonferroni’s correction for multiple tests. *, vs. control: E2F7 HCC-early, P = 0.020; HCC-advanced, P < 0.001; E2F8 HCC-early, P = 0.001; and HCC-advanced, P < 0.001. (B) Promoter occupancy of E2Fs on the E2f8 promoter. E2F1, E2F3A, and E2F3B tags were identified by ChIP-seq conducted in MEFs overexpressing E2F1, E2F3A, or E2F3B. (C) Correlation between expression of E2F7/8 and MKI67 mRNA levels in the data set described in A. P values, linear regression analysis. (D) Representative pictures of livers (top) and H&E-stained liver sections (below) from DEN-treated 9-month-old 7fl/fl 8fl/fl (control), Alb-Cre 7fl/fl (7Δ/Δ), Alb-Cre 8fl/fl (8Δ/Δ), and Alb-Cre 7fl/fl 8fl/fl (7Δ/Δ 8Δ/Δ) male mice. Areas of HCC are outlined by dotted lines. T and N, tumor and normal liver, respectively. Scale bars: 1 cm (top) and 100 μm (bottom). (E) Box plots showing the ratio of liver vs. body weight (liver/body wt.) of 9-month-old DEN-treated male mice. Outliers are represented by gray dots. Wilcoxon tests with Bonferroni’s correction. *, vs. control: 7Δ/Δ, P = 0.009; 8Δ/Δ, P < 0.001; and 7Δ/Δ 8Δ/Δ, P < 0.001. (F) Histopathological analysis of livers from E. FCA, focal cellular atypia, NSL, no significant lesions. Fisher’s exact tests with Bonferroni’s correction. *, carcinoma (focal/multifocal) vs. control: 7Δ/Δ, P = 0.004; and 8Δ/Δ, P = 0.13. ‡, multifocal carcinoma vs. control: 8Δ/Δ, P < 0.001; and 7Δ/Δ 8Δ/Δ, P = 0.015. (G) Box plots showing liver/body wt. of 9-month-old DEN-treated female mice. Wilcoxon tests with Bonferroni’s correction. *, 7Δ/Δ 8Δ/Δ vs. control, P < 0.001. (H) Histopathological analysis of livers from G. Fisher’s exact tests with Bonferroni’s correction. *P = 0.026, carcinoma vs. control. n, number of mice or patients per group.